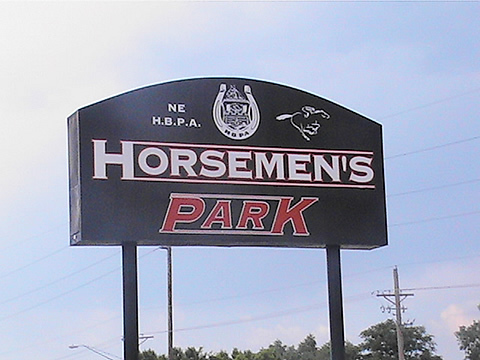 Horsemen's Park, located in Omaha, Nebraska opened on January 3, 1998. It is unique in that it is the only TRA track owned by a Horsemen's Group. Upon the closing of Omaha's Ak-Sar-Ben race track in 1996, the Nebraska Horsemen's Benevolent Association, under the leadership of Robert E. Lee, decided to build a new track and simulcast facility in Omaha to help preserve live racing in Nebraska. The inaugural live race meet was run in July, 1998. Acclaimed as one of the finest simulcast facilities in the country, Horsemen's Park has a seating capacity of 3,000 and over 700 televisions. Through a revenue and purse sharing agreement with the four other tracks in Nebraska, the goal of preserving live racing in the state has been achieved.